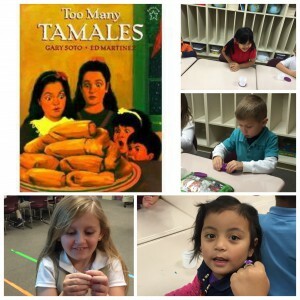 Primary students in Mrs. DeCamp’s World Language class at Jeremiah Gray Elementary learned about the Mexican tradition of making tamales for special occasions by reading the Gary Soto book, Too Many Tamales. In this story, a little girl thinks she lost her mother’s wedding ring while making tamales and has to make a whole new batch! After reading the story and watching a video about making tamales, students used play dough to make their own tamales. They were surprised to find rings hidden inside the dough!